The economic laws of supply and demand have led to us doubling the size of our largest macaron box. Our customers wanted to be able to order larger boxes, so we’ve created a new 24 box available in store and online for delivery. If you’d like to try a broad range of flavours. Choose our Best Selling Flavours box. 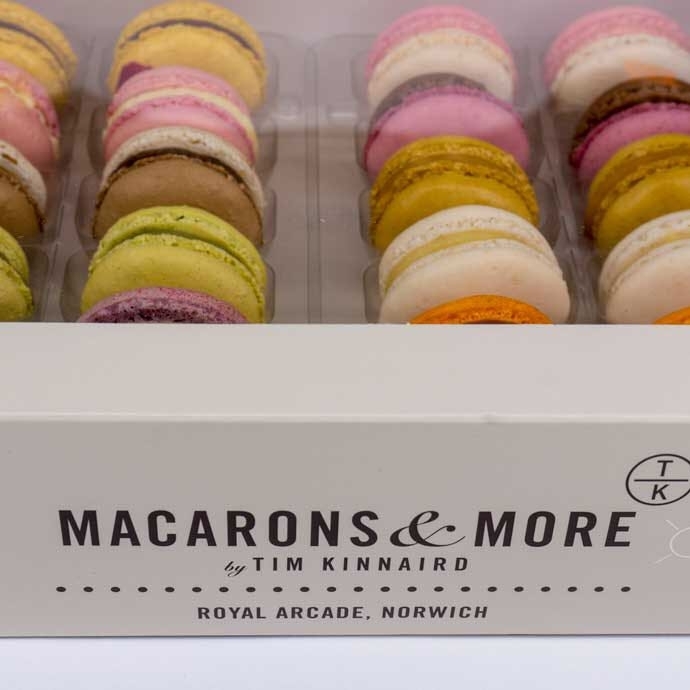 Your box of 24 macarons will contain 2 of each of the following: Rose, Passionfruit & Milk Chocolate, Lemon, Vanilla, Pistachio, Cappuccino, Salted Caramel, Praline, Lavender, Chocolate & Cherry, Strawberries & Cream, and Chocolate Orange. For those that already know their favourite flavours, there’s the Pick Your Own option. Simply click on your desired flavours and watch the box fill up! When we receive your order, we’ll be able to see exactly which of our delicious macarons you have chosen and we’ll fill your box accordingly. A box of 24 macarons is a good sharing size. You could treat your co-workers or grab a box for a big family get-together. Our macarons should be stored in the fridge and are good for 7 days after delivery. Remember, delivery is free to UK addresses on orders over £40! You can earn Loyalty Points on all your purchases by signing up to a Macarons & More Loyalty Account. Be the first to know about our latest business innovations and bakery creations, follow us on Instagram.